Has the snow and wintery weather been keeping you from running as much as you’ve wanted to? Coming this April is a perfect reason to getting running again in support of yourself and a good cause. 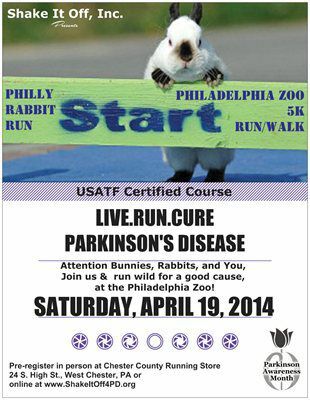 Shake It Off, Inc. presents the Philly Rabbit Run 5k at The Philadelphia Zoo! Proceeds benefit Parkinson's research, during April, Parkinson’s Awareness Month. PRE-REGISTRATION by April 1, 2014 includes a free t-shirt and free zoo admission (up to a $20 value!!). This event is for all ages and is a great reason to come out and walk or run 5K in support of Parkinson’s disease. Bring the family! To register online go to at Active.Com or in person at West Chester Running Store,West Chester, PA. Walk ups day of race registration begins at 7 AM. Arrive early to avoid lines! Parking available at the Zoo for a fee.